When I first started playing rugby, aged seven, there were no girls' teams - so I had to play with the boys. But a lot of young girls are not comfortable with the thought of playing rugby with boys. That is why I am so thrilled more opportunities for girls to play are being created by the Welsh Rugby Union, under a new girls-only rugby initiative. Personally, when I was growing up, I just wanted to do what my brothers were doing, so for me it was not a problem to join in with the boys. But some girls simply do not want to be playing with boys at that age, for so many reasons. They might have gone down the netball or hockey route instead, but if you are good at netball, there is no reason why you might not be good at rugby too - and enjoy it. So crucial, new opportunities to play can only help grow the numbers. It is huge that girls are getting more opportunity to play at grassroots. The more competition, the more people watch the game, it's only going to be going in the right direction. The game will get bigger and bigger - and I want more girls to be able to experience what I have been lucky enough to achieve. 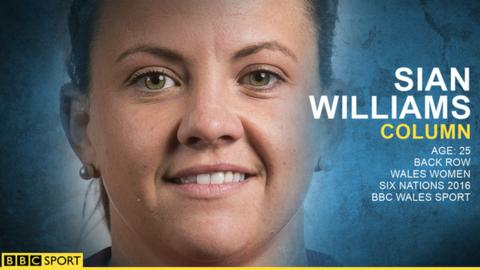 Since it was announced that I had signed the first professional rugby deal for a Welsh woman, the media attention has been an absolute whirlwind. It has been pretty overwhelming, and a massive shock for me. My Nan has got a scrapbook so she keeps all the newspaper clippings. It died down after a few days and eventually the phone stopped going off - now I am back to the daily, dream-come-true routine of training. But is it all totally new to me, as a female player, you do not usually get that much publicity. However, it is a boost for all the girls that our team has been recognised and I hope it is the start of a much bigger story for Wales. My teammates have given me plenty of banter in the last two weeks about having a professional deal. But everyone is really happy that the game is rolling in the right direction, so it is all in jest and it is quite nice. I like that we get to spend a lot of time together during a Six Nations campaign, having meals together. We like to stay relaxed and then we switch on when we need to switch on; so when we are not talking rugby, or playing rugby, it is completely chilled. We are playing 'call or delete' at meal times, if anyone is caught with their phone out while having dinner, which has been quite funny - I think Rhys Edwards, our head coach, has been deleted from a few phones. Then one of the girls does everyone's hair on a match-day morning. She will plat hair sometimes, as certain people want their hair out of their face during the game. But some girls are actually very superstitious. Back row Sioned Harries likes to sit on the same seat on the bus, wherever she goes, and if someone sits in her seat, it is like all hell is going to break loose. Even in the changing rooms, she has a space where she wants to sit - it is all part of her superstitions. But after all the joking, we know we have a very serious game on Sunday, when France come to the Gnoll. Beating Scotland was a vital step, but France at home is going to be a tough game, because they are never easy and they are playing really well at the moment. We are the home team so we have home advantage and they are slightly renowned for not travelling well so hopefully we can take advantage. It is quite difficult for the travelling teams in the women's Six Nations, even though we do get looked after by the staff as well as possible. But the Gnoll is a great pitch. There is a lot of history behind it. It is nice to have a home for rugby for our women's squad. It is terrific to play there and the pitch is in excellent condition, despite this winter's storms. If we can beat France, then we can start thinking about the next task - England. If you've been inspired by Sian to try rugby you can find out how to get involved here.